There is growing evidence that the traditional role of the sales organization in business-to-business marketing is quickly evolving from a tactical, operational function to a strategic capability concerned with the management of critical processes that support business strategy and deliver value to profitable customers. This topic is of major relevance to scholars in both the sales and marketing domains, and this relevance is underlined by the intense interest of managers and companies in how this field is changing. 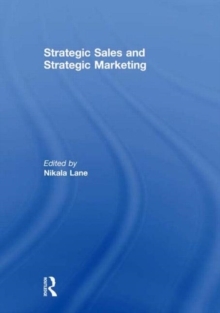 This collection is a unique gathering of views on the critical issues to be confronted in the strategizing of the sales function, from distinguished scholars from throughout the world. Their focus is on the linkages between strategic marketing and the corollary of strategic sales. This book was published as a special issue of Journal of Strategic Marketing.